Our community has all the joys and sorrow of our world. It has its celebrations, its rituals, and repeated acts of observance. It is a very beautiful place to live. This history is by no means complete, as all histories are never complete. There are errors, no question, simply because people view and react about the world differently. I felt that now is the time to publish this little booklet so the community that we live in has a greater understanding of what went on before and what the joys of participating here can be. 1555 - Roger Coe mentioned in Fax’s Book of Martyrs. 1710 - Homestead built where Robert’s eventually lived. 1717 - Concklin Fruit Farm established. 1734 - Samuel Coe came to Rockland County. 1742 - Coe’s Tavern on Route 45 & New Hempstead Road. 1780 - Major Andre and Josh Hett Smith stopped at Coe’s Tavern. 1788 - Largest quarry in Clarkstown operated by James Thorn. 1799 - Samuel Coe’s Cornor at So. Mountain Road and Zukor Road. 1813 Stone from quarry built Trinity Church. 1848 - William Roberts is in America. 1852 - Stagg’s Cornor – Blacksmith Shop. 1860 - Census for Clarkstown. 1865 - Population of Clarkstown was 4,023. 1866 - Eliza Gibbons married William Roberts. 1867 - Short Clove cut by William Roberts. 1872 & 1873 - Deeds from Coe to Roberts recorded. 1875 - New City has a railway station. 1883 - Settlement house movement in London. 1906 –Thomas M. Roberts married Ella Edith Blauvelt. 1912 - United Neighborhood Guild. 1912 - Adolph Zukor took residence. 1924 - Bear Mountain Bridge completed. 1927 - Lake Lucille Realty Company started. 1929 - Christies Airport established. 1930 Gibbs Barn now a restaurant & bar. 1931 - George Washington Bridge opened. 1936 - Lake Lucille Property Owners Assoc. formed. 1950 - LLPOA annual picnic started. 1956 - LLPOA took over the management of all lake property. 1957 - Dues were $5.00 per year. 1959 - LLPOA First Constitution & Bylaws. 1962 - LLPOA bought the lake water system. 1967 - Lake had 90% oxygen rate. 1968 - Flag pole erected at field for Larry Rose. 1972 - Hurricane Agnes washed out dam road. 1975 - Ella Roberts passed away. 1980 - Lake sewers were put in. 1985 - LLPOA purchased Baby Lake property. 1999 - Hurricane Floyd was a disaster. 2001 - Lake finally dredged and new dam built. 2001 - New dam dedicated to Fred Siegriest. Lake Lucille, Map 100, has a history of its own. A piece of earth, a title here and there, the living on the land, the buying and selling of property, the flow of water constantly repeating itself, the fish that seem to dream, the flight of birds, the animals that live at night, and those that sleep until we become awake, have been here always, the houses that were bought and sold, those that moved on, the dances of celebration and ritual which we created, and the deaths of people who stayed here, this is our heritage, the silent life of the past that haunts and embraces our roads. Two streams converged at the site that became Lake Lucille. One of the streams was the source of the Hackensack River. The official US Geological Survey locates the headwaters of the Hackensack River as just east of Little Tor Road, next to the stream. If you dig through the weeds, you can find the little monument stone marker with a brass US Geological plaque affixed to it. Historically, the Lenni Lenape Indians lived in our area. They were largely independent communities, sharing a common ancestry, and spoke dialects of the same Algonquian language. They were either Munsee or Minsi, depending on the interpretation, which was translated as “people of the stone country.” The name Munsee first appeared during the historic period in the Pennsylvania Colonial Records of 1727. We think they were here because Thomas and Richard Roberts found traces of what they believe were two cooking sites alongside the creek that flows into Lake Lucille. There were American Revolution activities around our area from 1775 to 1783. The Battle of Stony Point, in 1779, affected the people who lived here. Kings Ferry was a major crossing for the Continental Army on the Hudson River; the American and British armies moved across our landscape. The people who lived here were divided. Some supported the Revolution, some were against it, and some wished it would end. Samuel F. Coe came to Rockland County in 1734, from England. It should be noted that the Coe family name appeared in history in Fax’s Book of Martyrs, September 1555, mentioning the trial and burning of Roger Coe during the reign of Queen Mary. The corner of South Mountain Road and Zukor Road is now the home of Jan Connor. We know it was built prior to 1844 because in 1799 it was known as Samuels Coe’s Corner. The Coes were farmers and merchants during the founding of our country. Samuel Coe in 1742 owned Coe’s Tavern (there were so many Coes that the same first name appears over the generations), located at the corner of New Hempstead Road and Route 45, opposite the church. Major Andre and Josh Hett Smith were said to have stopped here on the way to meeting Benedict Arnold in 1780. In 1788, the largest quarry in Clarkstown was operated by James Thom, who purchased Richard Coe’s quarry, which later became part of the Roberts Farm. In 1813, stone from this quarry was used to build Trinity Church in New York City and Holy Trinity Church in Brooklyn. Deeds from Coe to William Roberts show the sale, in 1872, of 48 acres for $3,000; in 1873, 11.24 acres for $500; and in 1883, 11.24 acres for $400; a total of 81.72 acres. That included the land on Map 100 that is now owned by the Lake Lucille Property Owners Association. The Coe family owned the three historic homes in our area during the 1700’s and into the 1800’s: the Roberts Homestead, 370 South Mountain Road, and 4 Lucille Blvd. The earliest evidence of a Coe coming to Rockland County indicates that Samuel Coe came in 1734. 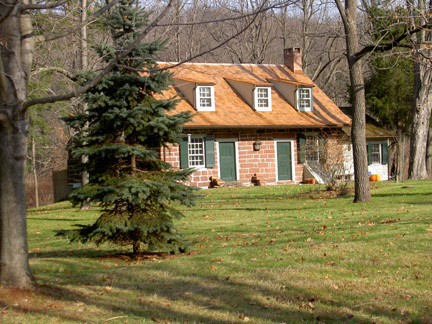 A photo of the Roberts Homestead was listed in “Pre-Revolutionary Dutch Houses and Families in Northern New Jersey and Southern New York” by Rosalie Fellows Bailey. The paternal Roberts grandfather, William Roberts, came from Todmorden, Yorkshire County, England. He was born in 1814, and we know that he was here in America in 1848. Eliza Gibbons married William Roberts in 1866. The original farm house of the Roberts family was built in 1710, and the title passed through different hands, including Coe, Van Houten and perhaps a few others, but in 1872 deeds show the sale of the farm from Coe to Roberts. In 1906, Thomas M. Roberts married Ella Edith Blauvelt. They had four children, Thomas Edwin, George Lawrence, Richard James, and Alice Irene Roberts. On the farm, the Roberts’ kept cows and a team of horses. 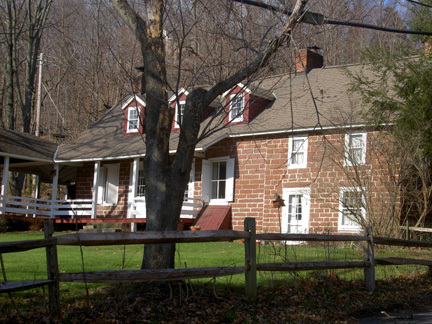 Mr. Roberts cut cordwood on South Mountain and hauled it to Malley’s brickyard in Haverstraw. The family had plenty of fresh milk and made their own butter. Raised chickens for the eggs and for consumption. Two pigs were fattened each year, butchered in the fall and sent out to be smoked. The farm produced turnips, potatoes, cabbage, apples, pears, peaches, plums and grapes. The children trapped mink, skunks, opossum and raccoons, dried the hides, and sold the fur to a firm in New York City. In 1813, Van Houten and Coe spent $100 to build Street School. The school consisted of two rooms: one room for grades 1 to 4 and the other for grades 5 to 8. There was an outhouse, a pot belly stove in each room, and a hand pump for water on the south side of the school. As the population of Clarkstown changed over the years, the school grew. Most of the children of Lake Lucille attended Street School until it was shut down in 1975 (it is now a community center). Congers High School (now Congers Elementary School) was built in 1927. It was the first High School in Clarkstown. Prior to that time, the children from our area went to Haverstraw High School. The 1860 Census for Clarkstown shows that at that time there were the following livestock in the town: 677 horses, 850 oxen with calves, 1,111 cows, 97 sheep and 876 swine. In 1865, the population of Clarkstown was 4,023. Stagg’s Corner, at the intersection of Old Route 304 and South Mountain Road, was a blacksmith shop in 1852. A branch line of the New Jersey and New York Railroad from Nanuet connected to New City in 1875. One of our neighbors, Adolf Zukor, who founded Paramount Pictures, lived at what now is known as the Dellwood Country Club from 1918 to 1938. Christie Airport on Old Route 304, where there is now a defunct gas station, was created in 1929, converting the dairy farm into an airport. In 1929, flights took passengers to see New York City and the Worlds Fair from the skies above. In December 1969, the final flight out of the airport was taken. The United Neighborhood Guild owned 28.4 acres of land from 1912 to 1945. It owned the house at 370 South Mountain Road, sited on1/3 of an acre; and the remaining acres were on South Mountain Road east of Zukor Road. The Guild was a recreational camp for low income people. It was part of the American settlement house movement, which was started at Toynbee Hall in London, England, in the year 1833. During World War II, the Huntington Estate (a large mansion where High Tor State Park is now) was a rehabilitation center for wounded naval personnel who used the lake to swim. In 1955, the Tappan Zee Bridge was completed, and this started the continuous development of the area. In 1927, developers Gottlieb Schnepf, Frank E. Knox, and Tom Milsom bought from the Roberts family 80 acres for $20,000 dollars, which included the Dellwood community. They formed the Lake Lucille Realty Company. Irving Blauvelt at that time lived at 4 Lucille Blvd. (In 1869, it was known as the Garrison Homestead.) In 1928, Schnepf built the dam which created our 17-acre lake. Schnepf and associates actually only owned about 15.5 acres, and the Roberts family owned the western portion of our lake, which is now divided into individual lots. Lake Lucille is named after the wife of Frank E. Knox. Schnepf started the Lake Lucille Realty Co, Inc. to sell lots for cottages and bungalows. At this time, Map #100 was established. The water system, which was laid out on both sides of the lake, supplied water from a deep artesian well drilled down into red sandstone rock. Later, the well, which supplied the south side of the lake, went bad. Everyone there had to drill his own well. The present well has a 5,000 gallon storage tank to meet the needs of the 36 homes on the system. The Schnepf barn, which was built by Charles Gibbs in 1920, housed cows until 1927, when Schnepf purchased the property. It was located at 3 Lucille Blvd and was turned into a bar and restaurant. The house at 4 Lucille Blvd. was built probably in the 1700’s and later expanded. The house at 1 Lucille Blvd. was originally the sales office for Schnepf. The house at 346 South Mountain Road was a small general store run by Lillian Dembnicki’s mother. In the 1930’s, the children would shop there for ice cream. Lillian’s father operated an automotive repair shop at 247 Zukor Road. Back in the 1930’s when there were only 17 homes at the lake, mostly summer homes, 10 Wyndham Lane was built. 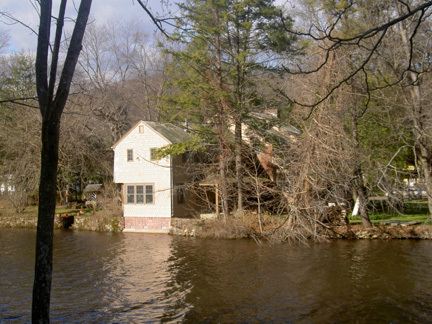 It was a small cottage which was known as “Shady’s Cove” because of the small cove on the western side of it at the edge of the lake and the many pine trees that surrounded and shaded the home. In later years the house was purchased by Dr. Zaraleya and eventually owned by both Dr. Zaraleya Harari and her husband Dr. Carmi Harari. They added another wing to the house that included a large bedroom suite and two studies, as they both had their doctorates in psychology. Zaraleya was listed in Who’s Who in American Women, and Carmi was the founder and Director of the International Society for Humanistic Psychology. A book with the name “Shady’s Cove” printed on the cover was located in the home which contained numerous entries of signatures dating back from the 1930-40s, some pictures of the home and newspaper articles about the area. They were found by K. Jody Cucolo, Zaraleya’s daughter. On the 22nd day of August 1936, the Lake Lucille Property Owners Association was formed. The original directors who formed the association were William Dennis, C.O. Conklin, George Berg, Eminio Juliano, Robert Beatty, C.H. Dyson, and Richard Hellmund. Schnepf managed the property, road repair, snow plowing, dam, maintenance, etc., until his death. On August 16, 1956, the property was deeded to the Lake Lucille Community Association, which in recent years was merged with the Lake Lucille Property Owners Association (LLPOA). In 1956, the dock on Lake Road was completed at a cost of $250. In 1957, the Association dues were $5.00 per year. The dam was showing signs of deterioration in 1958, and dues were raised to $15.00 per year, with $5.00 earmarked for a sinking fund for dam maintenance. Our first Constitution and Bylaws were published in 1959. A Certificate of Privilege was issued to each homeowner. It stated that all guests availing themselves of lake privileges must be accompanied by a member of the immediate family, and that all cars must be parked on the property of the member. To keep strangers off our private roads, we had a provost marshal system with a roster to patrol the lake on weekends. We had tags for each family, allowing them to swim and use our roads. Members themselves performed all the work on our roads. We had work parties in the spring and again in the fall. The work parties kept our dues down and encouraged community participation. Because of flooding, we had to raise and lower the sluice gate by hand during bad weather. In 1961, Eddie Schnepf agreed to sell to the Association the Lake Water works, pump-house, associated equipment and two 50 by 100 foot lots fronting on Milsom Drive, $2,000 for the pump-house lot on the corner and $1,000 for the adjoining lot. The Association assumed ownership in 1962. We had a Monster Turtle at our Lake in 1962. It was a snapper who weighed somewhere between 40 and 60 pounds. It started hanging around the swimming area. It was very traumatic, because we were afraid to go into the water. A couple of evenings, all the fathers who had guns lined-up on the shore taking aim. Every time the turtle poked its head up out of water, they shot. They hit it many times, but the ole Monster swam away. After not seeing it for a few days, we all became brave again and went back into the water. The following summer, Harry Graziano in a canoe shot a turtle with a bow and arrow, he was with his sidekick Gary Davidson. After dragging it to shore (still alive) they could see bullet holes in its shell, and everyone believed that they finally killed the Monster. There were many snapping turtles at the lake. Some of them were sold to Chinese Restaurants in the County, going for about one dollar a pound. We once celebrated the holiday season by taking a piano out of Jean Grube’s house and bringing it to the dam on the bed of a truck. We had one streetlight, which was over the sluice gate. We only turned the light on when we wanted to. Joe Horner hopped up on the truck and we sang songs while he played. We drank lots of hot chocolate and glugg. The lake was tested around 1967. We had a 90 percent oxygen rate, excellent for trout fishing. In the early days, the Lake was fishing grounds for many rare Blue Kingfishers. The first Association picnic started in the late 1950’s on Gunter Meier’s (now Roger Grahn’s) and Fred Siegriest’s lawn. Later, it was held at Larry’s Field. Our sound system for the picnic was a mike and amplifier that belonged to the Fire Department. At that time, at least four or five members were in the New City Fire Department, and four or five in the New City Ambulance Corp. (Archie Davidson and Fred Siegriest were among the first ones to organize the New City Ambulance Corp.) We have had folk singers, square dance callers, bands at the picnic, games and contests and once a little girl, a Gottesman daughter who happened to be in the cast of Annie on Broadway, belted out a song on top of a piano that belonged to a small band that we had hired. The bandleader had us take his piano out of the Legion Hall in Haverstraw and bring it to the field. There was an Ice House on Route 202, where we bought ice for the picnic, and, of course, always fresh Smith’s corn. The present beach came about in the early 1960’s through the efforts of the mothers (Betty Farkas, Marge Cangiano, Toni Ceresnak, Marti Siegriest, Helen Puchelt and others) of the lake. The children had outgrown the baby lake but were still too young to use the dock and raft. They had no place to swim. The parents surveyed the shoreline and decided on the present spot. Mr. Steinberg, who lived across the road, had had his vegetable garden there for many years, although it was lake property. He was not pleased with the site we chose. However, the mothers lobbied and the Association voted to establish a beach there. But the mothers were asked to come up with the money to fund it. So they held spaghetti dinners in the field. Tables, chairs, and silverware were borrowed from the New City Fire Company and Germonds church. They had a very successful event. With sweat equity, a telephone company truck to pull out the stumps (thanks to Winnie Wanamaker) and the spaghetti money, the beach was established. The mothers then organized swimming lessons, and when the children were old enough they became junior lifesavers. In the late 1960’s, we decided to repair the sluice gate. To do that we had to empty the lake. Beside all the game fish, we had almost wall-to-wall goldfish in the lake; not the bottom carp that we still have, but ten to twelve inch fish. Well we had dead fish, literally thousands of them, on the banks, down stream, etc. You could smell the stench in New City. Every agency in the world was upon us wanting an explanation. What we did was hire trucks, and each night when the men came home from work we filled barrels of dead fish. The town kept the dump open for us, and they buried the fish when it arrived. This went on for at least two weeks. In the last half of the 1960’s, we started our Aqua Fairs: fishing contest in the morning, decorated boats with trophies as prizes, swimming contests according to age groups, boat races, and the lake supplied refreshments for all. It was a full summer’s day. 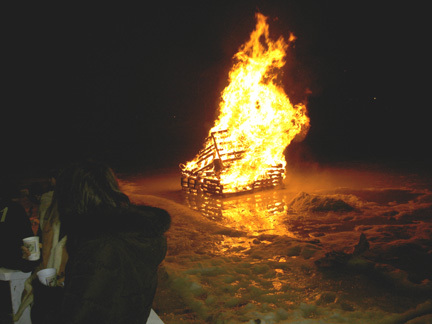 Annual ice skating parties with a large bonfire on the lake and hot chocolate and glugg were fun. We saved our Christmas trees to burn at the party. During the Vietnam War, the children of the lake organized a peace march, and at least thirty children marched to Ed Jeffs’ house, the house of the only president they knew, and they demanded that the war should end. He solemnly said he would notify the President of the United States of their concern. In the 1970’s, we were told that we had to have a lifeguard at the lake. We then hired a swimming instructor, sixteen of us qualified as lifeguards. Problem solved. After Hurricane Agnes in 1972, the dam was unable to control the water flow even with the sluice gate open. The pavement on the bridge buckled and needed replacement. Our downstream neighbors brought in the U.S. Army Corps of Engineers to assess the problem. They stated that we had insufficient water retention capacity “ as a result of the natural siltation process from the slopes above the lake due to construction and sludge deposition by the town sewage treatment plant.” We started our first attempts to get the lake dredged then. Our lake was dying from multiple causes. The town never assumed culpability for its actions that allowed a sewer treatment plant to flow into the lake, thus providing rich nutrients that increased the growth of algae. The town also approved and put a sewer line into the lake directly from the roads in Dellwood. This resulted in the oil from cars and chemicals that are used to prevent weed growth flowing directly into the lake. The town did nothing to prevent the silt from new upstream construction from flowing into the lake. We became alarmed, and started our efforts to reclaim and preserve the lake. Frank Contalmo, our president at the time started the research that was necessary to begin our fight. People started working hard to get the lake dredged, countless meetings from 1972 to 1990’s.  Two people were prominent in this drive, firstly Jaya Bhattacharyya and Terri Thal, who worked closely with town officials and the DEC, and mobilized the community; others who continually fought were Bill McKinstry, Steve Wren, Steve Murphy, Sandy Bergold, Carol Palustre, Anjan Bjattacharyya, Ed Jeffs, Fred Siegriest, Mabel Krasny, Roger and Marie Grahn, I am sure there were others, because we all were deeply concerned. In 1975 on March 11th, Ella E. Roberts died, the Roberts’ property was passed to her four children, and was subsequently sold to developers. It was the end of an era for the Roberts family. Richard Roberts still lives on part of the property. When the Roberts land was developed, the West Branch Conservation Association convinced the town to cluster the new development. The almost 70 houses were kept away from our lake, as a result our view of the lake was scarcely changed. In 1980, the Department of Health, forced the town to put in sewers. Leech fields were affecting our wells and also contaminating the lake. All homeowners had to stop using their septic tanks and connect to the sewer system. In the early 1980’s, someone enticed a movie company to come in here. They shot pictures of someone swimming off the dam and in the lake. There and wires all over the place. As it turned out, it was for a soap opera, and our chance for fame was about 30 seconds. Women always have been active in the lake community, but none were trustees until the 1980’s. The first women trustee was Marti Siegriest, who was appointed by our president, Frank Cangiano. Mabel Krasny was our first woman president and Terri Thal was vice president. The Association in 1985 purchased the Baby Lake for $3,500 from the F.L. Holding Corp. This purchase included the south side of the Baby Lake, which is bounded by Lucille Boulevard, and Brook Lane. It also follows a very narrow strip on both sides of the brook down to Zukor Road. During the 1990’s, the lake was deteriorating rapidly. Hurricane Floyd, in September 1999, was a disaster for many of our residents. Basements were flooded and deep holes were created by the raging waters. The efforts to dredge the lake became more intensive. Eventually , LLPOA residents asked the the town to create a water district comprising the residents of Map #100 and residents of Dellwood and Roberts developments whose houses had lakefront property. We faced the problems of how to clean up the lake and stop the storm damage. With the help of town supervisor, Charlie Holbrook, a lake district was formed, at a cost to ourselves. Thomas Morahan and Alexander Gromack were instrumental in helping us accomplish our goals. In 2001, the lake was dredged, the shoreline reestablished and the dam rebuilt to handle our flooding problems and revitalize the lake. 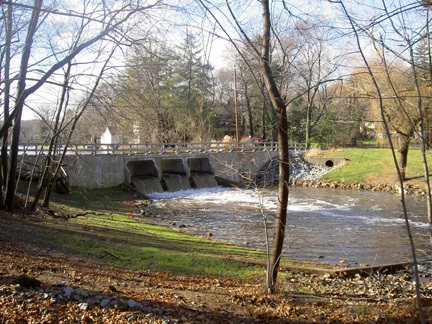 On October 14, 2001, the Association gathered at our newly-constructed dam to dedicate it to the memory of Fred Siegriest. Steve Wren opened the ceremony, then Elizabeth Carl and Julie Wendholt sang “America the Beautiful,” Ed Jeffs, Roger Grahn, Brian Davidson, and Anjan Bhattacharyya all spoke from their hearts. Fred truly gave his being, energy and efforts to the community. Ed Jeffs wrote the inscription on the bronze plaque. Greg Giler moved the rock and affixed the plaque, and Steve Murphy coordinated our efforts. Liz Carl and Julie Wendholt sang songs, Zaraleya and Carmi Harari prepared the hot dogs and hamburgers. The sound system was by Ross Wanamaker. On August 23, 2003 on the lawns of Brian Mertes and Melissa Kievman (4 Lucille Blvd. ), the people of Lake Lucille had the joy of watching “The Seagull” by Anton Chekhov performed by eleven actors. Brian Mertes directed the production and Melissa Kievman was the Producer/Chef. They spent five days rehearsing, and the actors were outstanding. A barbeque occurred between Acts 3 and 4. It was a highly enjoyable evening. This was a one-night only performance. On June 5th, 2004, there was a film crew at the lake shooting a movie called “Viking Rusty Forkblood.” Evan Daugherty from NYU was the writer director, most of the film was shot were in Harriman, but the lake scenes were shot here. The horse that they rented was beautiful. The woman riding it was charming and the crew were great. On August 21st, 2004, Brian & Melissa Mertes produced and directed the “Three Sisters” by Anton Chekov on their lawn. There was a haunting moment during the third act when the town was burning, about 400 hundred candles were floating in the lake, they reflected the burning town, the deaths, and the affirmation of our existence. Vershinin, in the play, sort of sums up Chekov when he says, “For many of us, life is lonely and hopeless, and yet, we know, that all the while, slowly but surely it grows clearer and brighter, and the time will not be distant when we shall live in radiance and light.” The actors were simply great. They were spirited, they danced, they sang, giving their whole heart to the performance. The barbeque after the third act, raised money for Habitat for Humanity. Some of the families that participated in the event to help accomplish its goals with food, shelter, etc. were as follows: Carl, Dreeke, Green, Intrator, Jeffs, Leavitt, Murphy, Riddle, Rocker, Shapot, Sinai, Wallace, Wooldridge. The end of the freezing spell was upon us, the ice was still frozen, but the melt was beginning. Joan Murphy chaired the ice skating party. There was hot chocolate for the young ones, and hot buttered rum for those who like to be young again. The preparation was a community event. Mathew Murphy, Brendan Wren and Greg Rose did the pioneering work of clearing the ice. Steve Wren and David Harold supplied the food for the bon fire, Robin Dreeke tested the depth of the ice. The ice was an average of 9 inches deep, perfectly safe. Everyone enjoyed the party.